People buy grass trimmers for one of two reasons. They use them either to keep the edges of a lawn looking neat and tidy, or to reach parts of the garden, where a lawnmower simply can not get to. That makes them a very useful tool to have for your garden. Which Grass Trimmer Should You Buy? These are the most popular choice for strimming for UK gardeners as they are affordable. Now very popular strimmers as they use a rechargeable battery, so no trailing leads. Below, I have gone into each of the five types in a lot more detail. That should help you make your mind up, which is the best type for your own individual needs. It is always a good idea at the start to take some time and make sure you have got the right one for your exact needs. The vast majority of the UK public will buy the corded electric type. That is because they work really well, and are the most affordable of all the trimmers available. However, it is worth pointing out, that many people are now making the move to the cordless version of these. Those are more expensive, but you don't have the hassle of a trailing electric lead. The more serious gardener, professional and landscaper who need to work on bigger gardens will almost always move to the petrol, or 2-stroke variety. The question that really needs answered, is which one suits your needs the best? Let's have a look at the three main types of strimmers below in a little more detail. 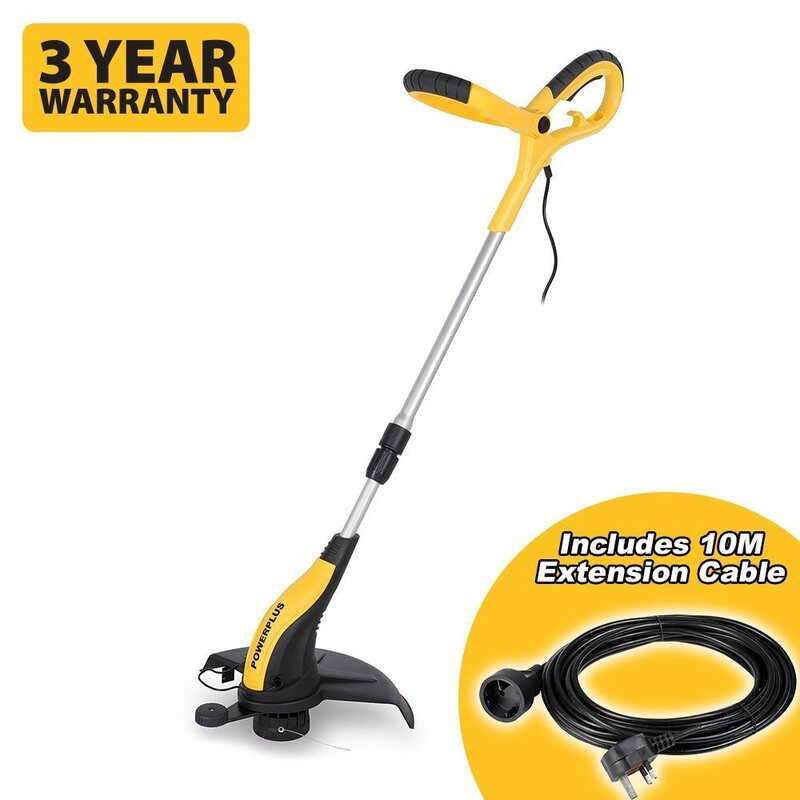 Ideal for medium to larger gardens, thanks to their cordless aspect. They are portable so also suitable for taking with you, to allotments, grave tidying or helping others. These are good for taking on the bigger and tougher jobs. They are pretty powerful, but also noisy and you do need to provide them with petrol/oil to run them. As the name would suggest these are trimmers that are operated by hand. These come in two types, either ones with short handles or the long handled versions. These remain quite a popular choice for many gardeners in the UK. The short handle versions are relatively inexpensive, but they do require you either bending over to use them, or kneeling on the ground. That is why some users, and especially those who want to avoid a sore back, prefer to use the long handled version of these types of trimmers and clippers. Both types can be used to cut grass in areas that the mower can not reach. More commonly though gardeners use these to get a nice clean edge around their lawn. You can read more about manual or hand grass clippers by clicking here. Those battery sizes can vary quite a lot from smaller 14 volt batteries and all the way up to 40 volts for the more powerful trimmers. The advantage of these is that they can go anywhere, and there is no annoying electrical cord to worry about. The information that I have provided above, gives you a very good overview of the various types that are available. It should also give you a good indication of which should be best suited to your needs. 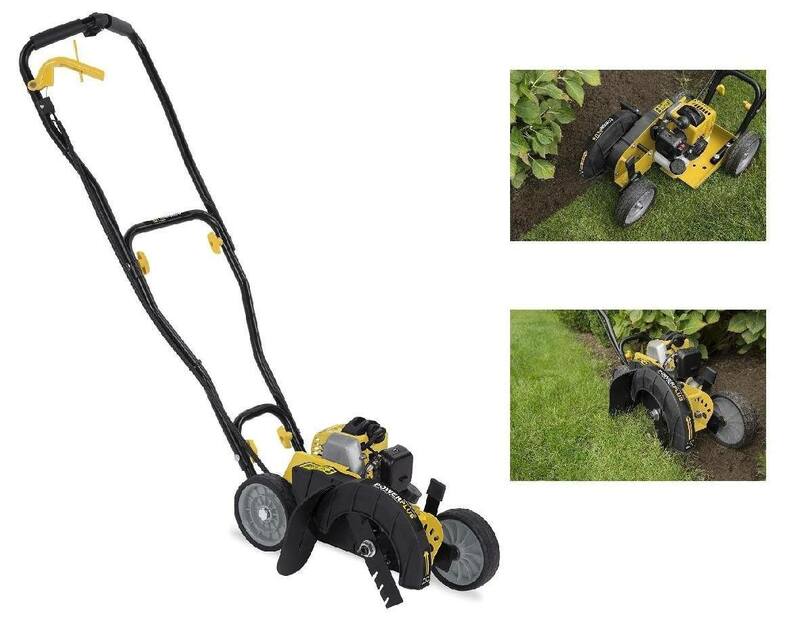 If you are new to gardening, or new to buying and using a grass trimmer and edger, then I would recommend reading our buyer's guide. Your number one consideration should be the size of your garden. With a small or medium sized garden the choice could be any of the above types. They will all work there, so really the choice comes down to your preference and your budget. You should also give some thought to what you want to use it for. Is it primarily for trimming lawn edges, dealing with overgrown areas of grass or weed, or for general purpose tidy ups? For larger gardens I would recommend either a cordless option, or a petrol style as they are portable and powerful. The petrol ones just get the job done quickly. The next thing you should consider is what will you actually be using it for. As I mentioned earlier, they are used for areas where the lawnmower can't reach or for edging. Most of these trimmers can be used for both. All that is required is to change the angle of the head, and you can use it for either purpose. They can however also be used for clearing path edges, trimming along the side of decking, around plants, shrubs, trees, garage walls etc. Some people will also use these to take on long grass. For a task like that you are better off with a longer shaft model and a very powerful motor. Most people still buy the electrical corded grass trimmers, but there is now a shift towards buying the cordless ones. It is the same idea as cordless drills, and cordless saws. There is a trend in the UK at the moment where people prefer cordless tools. That is because they now use Lithium Ion batteries, which hold their charge longer, and are easier to charge. 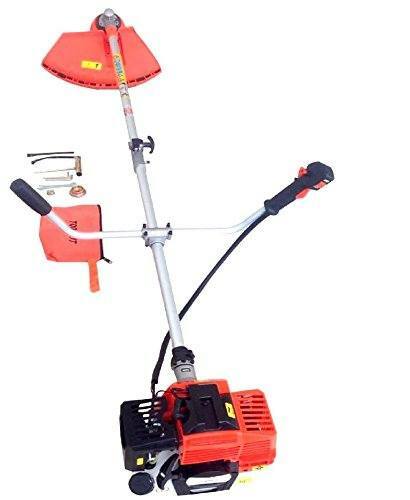 For larger gardens, or if you need to use these in various places, then my preference is always for a good quality petrol strimmer. 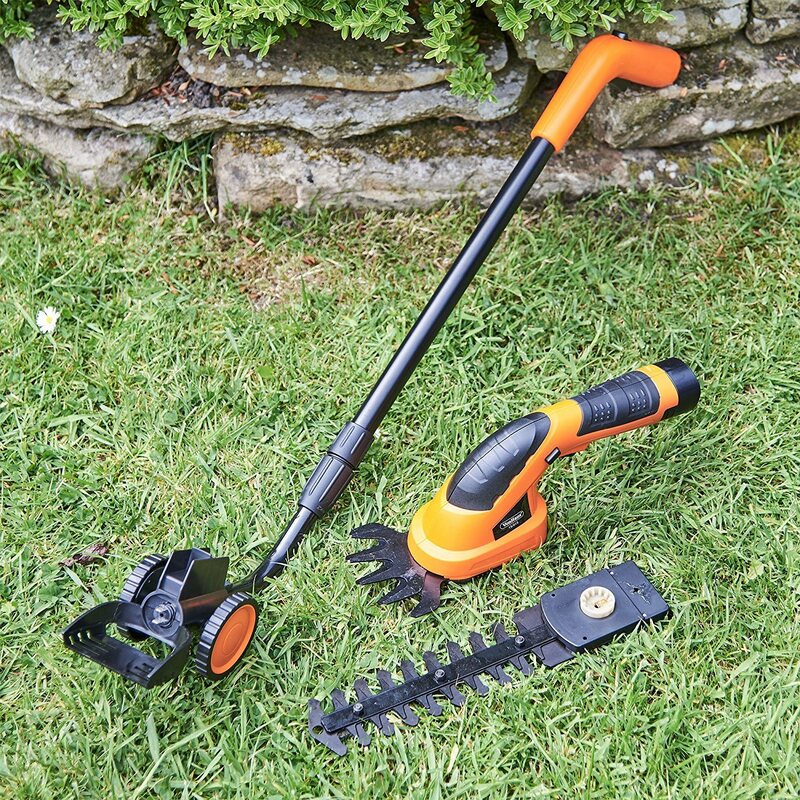 If your garden is small, then the simple hand held trimmers may do your job nicely. These are fine for smaller gardens. They also have the advantage of not spreading grass into your borders, or garden beds. With the power strimmers, although they are very fast, they do shoot the grass cuttings over borders and beds. Usually that means you have to tidy that up afterwards. 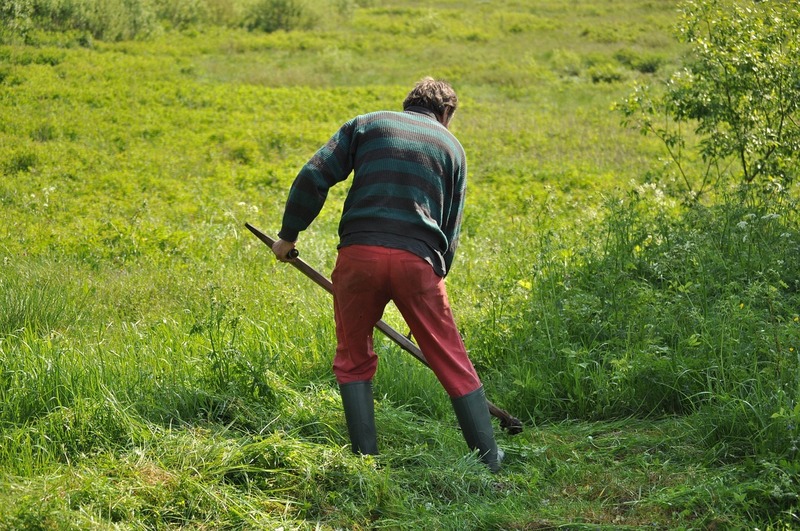 Now even when manually trimming like this, you will also need to tidy up, however the grass cuttings are less dispersed. That does make life a little bit easier when cleaning out beds etc. If we leave aside how these are powered, then the next most important feature to consider, is how they cut. A few will use spinning plastic blades. The huge majority though​, use a line of nylon cord. This cord comes in different thicknesses. This cord usually comes on a spool. When it runs out, you can either replace the spool for convenience. Alternatively, you can buy the string and wind it on to an existing spool. That can be problematic though as it needs to be wound on properly. Dual Line - ​Some strimmers, especially the more powerful type use what is called a dual line. Instead of one piece of cord coming out of the spool, there are two lines of cord. That increases the cutting power, and those are ideal for heavy or tall growth. I will say this because it is true, though the advice I offer below, is usually and sadly ignored. As a general rule all strimmers are safe to work with. However, they have electrical parts, spinning parts and need to be treated with care. When a strimmer head starts cutting, cut items can easily fly up into the air. That means they can get into your eyes, and that can be dangerous. You really should wear goggles of safety glasses when working with a strimmer. Most people don't but I so wish they would. Mind Your Toes - ​The strimmer head spins at very fast speeds. I have seen these cut through slippers and soft shoes. It is always best to wear suitable footwear, when working in the garden. Breaking lines - This accounts for about 90% of all the problems. Most strimmer lines will not break when cutting long grass. However if they catch something hard, then they snap. With auto-feed lines, the strimmer will feed out more line and that makes life a great deal easier. With some strimmers though, especially cheaper ones, you have to bump the strimmer base on the ground to feed out the line. More often than not, that doesn't work. As a result every time the line breaks, you have to remove the spool, pull out more line, and then re-attach the spool. Under Powered - If working with large areas of grass or weed, with tall grass or thick grass you will need a lot of power. Buying a cheap strimmer with a small motor is a bad idea. They just don't have enough power and the motor comes under a lot of pressure and will burn out quickly. Over Powered - Some buyers spend a lot of money on a big powerful strimmer. They maybe only use it to trim the edges of the lawn a few times a year. With a powerful strimmer, it can actually cut a lot more that you need it to. That can really mess up the edge of your neat lawn. ​Automatic Feed - More line is fed out automatically when the strimmer starts up. Manual Feed - As the name would suggest, you manually pull the line out and that is a huge pain. The bump feed gives you more control over how much line is fed out. You do have to remember to keep doing this. A problem for many gardeners is that they forget to do this. The line can then disappear back into the spool. If that happens, then you have to stop and fix that problem.